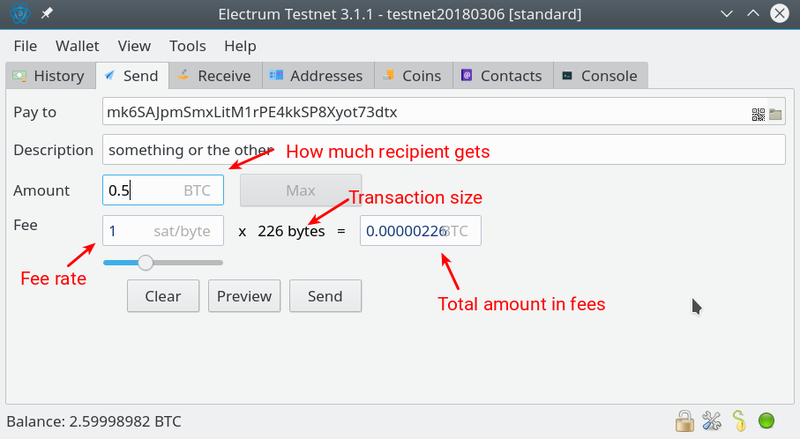 The fee displays "Target: Within 10 blocks, Current rate: 2.5 sat/byte" when I use electrum wallet to send BitCoin to other people. I can't understand completely the means of "Target: Within 10 blocks, Current rate: 2.5 sat/byte" ? How much should I spend if I send one BitCoin to other people ? Thanks! I hope you give me the details about how to calculate the fee! 1: The sat is 0.00000001 BTC , right? The further left you move the slider the lower the fee you pay and the longer it'll take to confirm. The further to the right you move the slider the higher the fee and the faster it'll confirm. If you still don't get it go to tools > preferences > fees tab and check edit fees manually. Now on the send tab you'll be able to see the whole calculation including the absolute amount of fees you will pay for a particular transaction.